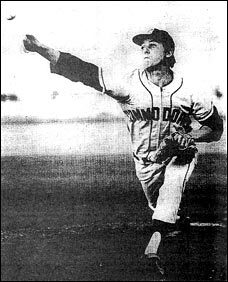 Left - Larry Nakonechny, pitcher and third baseman of the Saskatoon Commodores. While getting an opportunity with the senior club, Larry also played for the Saskatoon Junior Commodores. 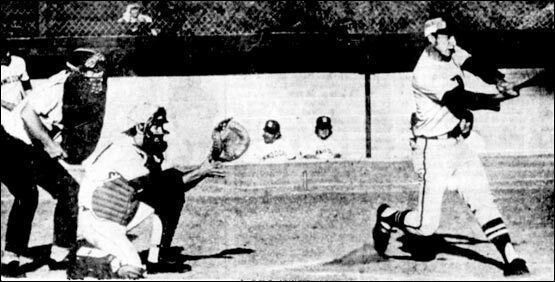 He went on to play with the Regina Red Sox in 1972 and with the Calgary Giants of the Alberta Major Baseball League in 1973 and 1974. 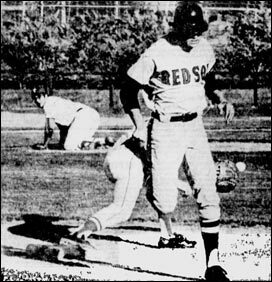 Right - Regina Red Sox rookie Ken McEachern beats the throw to first after his ground ball to third was bobbled by Yorkton's Gary Cooper. That's Don Laube reaching for the throw while pitcher Alex Bellegarde keeps an eye on the play. Right - Regina's Jerry Zrymiak makes contact, but barely, against Saskatoon's lefty Ken Haanen. Zrymiak's best this at bat was a foul. 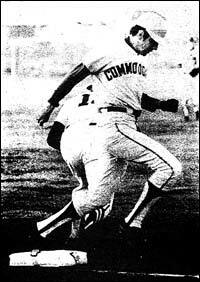 Commodore catcher Bob Brown awaits the ball. The umpire is Owen Gillstrom. Below - Safe at first ! Saskatoon's Randy Munch beat the throw to first.